For an enchanted moment, the ship must have held its breath. Plucked from a fairy-tale, somewhere forward of the port bow, a Sooty Albatross took to the skies, soared into view and hovered like an evangelist on the draught of the collective inhale. I remember turning wordlessly to Alisha, partners in wonder; and shared a dream, a lifetime’s second that will endure for as long as we care to look up. I can still hear the incredulous silence; the flash of confirmation; an out-pour of emotion – screams of backslapping laughter. Our small crew; we happy few, riding shotgun high on the fore of deck 12, danced on the clouds. We drew in big gulps of it; a wild, spontaneous joy that had come suddenly to the air, unaware of ourselves for one strange Tuesday morning hour. From the viewing decks of the MSC Sinfonia, on the 25th of April, and somewhere between 06h30 and 09h30, Birdlife SA’s Flock at Sea AGAIN!, steamed into legend. Save for a single, jaded personality who’d seen and done it all, every soul out on deck, fore or aft, wrote down something new, something special. Strangers rose above the station of their tags and became friends; and for the shortest time Flock at Sea was a murmuration of common purpose. It’s likely we’ll never see the same again & that’s okay. I know the Light-mantled Albatross was a stampede, literally for some, but for me, at least, that first permanently smiling, white-ringed Sooty was better, much better – an unsullied trend-setter & the axis in time for the other specials before & after. Blue Petrel, White-headed Petrel, Grey Petrel; and a myriad of albatrosses were the supporting cast – each worthy of more and, in time, perhaps, the centrepiece of their own tale in the retelling of it. Kerguelen (Kerr-ghee-lynn) Petrel was seen but we missed those. Someone said Oi (a gadfly mutton) but the Grey-faced Petrel hugged the slippery slopes of mystery and was not seen either. It’s no surprise that Wednesday was ordinary and proved a disappointment for many. The colder & darker seas that had held us enthralled were a distant night’s cruise away. The chumming attempt – a double-header serving of frozen fish-canapés, scheduled for 9 am.(why?) and dragged off the stern much later, was wholly unsuccessful, logistically fraught at (‘a slowed..’) cruising speed & a bumbling farce of broken crates & parted towing ropes. A mass-produced boogie-board with mermaids or dolphins (who doesn’t like dolphins?) – child’s play really, would have skimmed rather than drowned the offering. Mea culpa – a strategic blunder & a distraction away from the front of the boat where the cool birds hang out. Only a fool trips on what’s behind him … (anon). Seabirds ridge-soar on the updrafts created by the ship’s superstructure & cruise-ship Captains like to steam into the wind which may be why reported specials from the forward decks included White-faced Storm Petrel, Salvin’s Albatross and Salvin’s Prion… Chalk those up on the black-board of despair too! So, like a good marriage, we’d started off with a bang – a titillating hoedown straight out the blocks; and a hangover of distraction and supposed missed opportunity not long after. That kept us up & out on the cabin balcony way into the tea hours. The Sinfonia (‘Sin-fore-knee-ah’ – apparently…) blazed into the wistful night, its running-lights lighting the glassy sea for all the squid to see. Curiosity kills the squid we learned. Storm Petrels including Leach’s, Wilson’s and Black-bellied skipped, hopped, swooped – an aerial flaying / dismembering of the hapless cephalopods in nugget-sized bites! Albatrosses bullied the light-tripping stragglers further out but it was a pair of White-headed Petrels that held us enthralled; leap-frogging their way, on shuffle, at the starboard’s street-lit delicatessen – snatching antipasti off the surface. On the following night, the excursion’s last, the keen & the restless stood shoulder to shoulder at the railings of Deck 6; I assume to express their sympathies for the protagonists in their Squid Games struggles. Two more probable newbies buzzed the bow on Thursday morning in typical small shearwater fashion – their fly & flow routine characterised by a shallow, rapid wing-beat; a glide the tailpiece. Subantarctic Shearwater (x2) [P. elegans] from Chatham & the Tristan da Cunha group and its previously considered conspecific, the Little Shearwater [P. assimilis], more at home elsewhere in the Antipodes, both made it onto the high-5 list. Puffinus elegans was the 1st to show and despite the name, the Subantarctic Shearwater is unrelated to the puffins / auks – the only similarity being that they are both burrow-nesting seabirds. Puffinus assimilis, boasting a whiter face, with the demarcation line between black and white passing over or through the eye rather than below the eye as it does in P. elegans, beat a hasty retreat across the chop a little later. Naturally, an event of this magnitude was not without its controversy both out at sea and in the planning of the event itself; and in the interests of fair play and constructive criticism I want to deal with both. That does not abrogate from an excursion which was generally well organised and mostly sensible. The fact that people queued for extended periods to board the ship, is entirely the blame of MSC; a company renowned for bumbling farce and a laissez-faire attitude to service both on & off the ship. We paid R150 pp to fast-track our boarding – money well spent. Chalk that up to experience and our son Sebastian’s (2 yrs.) disregard for good form. The great albatrosses of the genus Diomedea are well known for their complex series of age-related plumage changes. Most adults, unlike other birds, continue to change, becoming progressively whiter as they age. The larger southern-breeding Diomedea exulans (Wandering) and the smaller Diomedea dabbenena (Tristan) from Gough Island (extirpated on the main Tristan group more than 100 yrs. ago) are especially difficult to distinguish in the field – some say impossible to separate reliably and yet genetic evidence confirms that the Tristan Albatross is distinct. Most accept that males are larger and have deeper bills than females, with less of a slender saddle behind the nail. From there it gets tricky – some evidence points to Tristan retaining the penciling on the underparts for longer, relative to the upperparts, which results in a more prominent breast band. Sexing & aging the bird against known age-related plumage progression, is currently mooted as a reliable field characteristic for separating the two species. Those criteria are soon to be published & peer reviewed. Based on the field characteristics proposed by an apple-picking, ex-civil servant, now MBE, author of Seabirds: An identification guide, co-founder of Zegrahm and with more than 150 excursions to the Antarctic under his belt, two birds we saw in his company were Tristan Albatross. Whilst not at odds with the Director of the Fitzpatrick Institute, the 1st A-rated ornithologist in SA and for 2 decades in charge of SANAP’s seabird research in the Southern Ocean, their views differ, some would say, fundamentally. Cynics will say that the species have been split to afford the geographically-distinct populations more protection (i.e. funding) & those of us not included in the gag are simply on the trail of the impossible, looking for clues that don’t exist. I’m not buying it. I am, in fact, front & centre in Peter’s camp. In other, less-savoury news, Wandering & Tristan Albatross expel, (from their nasal tubes), a mixture of saline secretion from their salt glands [all seabirds have them] & some stomach oil stained pink from the food they eat. This liquid dyes their feathers as it moves past their head, an unfortunate codicil in the Handbook of aerial snorts. It may be satisfying (gesundheit) but the aerodynamic forces associated with flight are applicable, even out at sea. Imagine, if you will, flying into an odoriferous spritz of pink sauce from an aerosol can…& you get the picture. Why the Royal Albatrosses don’t have the same staining is a function of the morphology of their bills. The Royals have larger, more bulbous nasal tubes. This fortunate adaption enables the Royals to vent their own versions of pink sauce with more expertise & as a consequence, further away from their fuselage i.e. no staining. As for the event one or two things come to mind; some positive – others negative. I usually don’t mention specific people by name but I think it’s important. Gisela Ortner was in constant touch with people, new & familiar. Her informal, more personal words of welcome, well received! I might have missed the others but that’s the point… I noted Gisela’s FB post – a simple word of thanks for the broader community’s support. That too is important. I look forward to something similar, in a nicely worded email, from Birdlife SA, soon. The demographic of birding has changed. People are getting younger – young families in the field are not uncommon. Although the Flock concept is world-class and should be SA’s equivalent of the UK’s Bird Fair & the delivery of the itinerary fine – detailed planning for families was almost entirely absent. Insufficient attention was given to families with young children and, let’s not forget, the use of the boat was exclusively Birdlife SA’s. I imagine MSC was difficult to deal with but that does not detract from ensuring that activities for children are thematically appropriate and at times when the birding was expected to be at its best i.e. early morning and late afternoon. The MSC’s usual activity-program [i.e children] was woeful to say the least. Many good birders missed out on the birds they hoped to see – employed elsewhere, supervising children, during the times inconsistent with the MSC program. Birdlife SA fell woefully short & missed an opportunity. The same applies for the older kids [we have a handful]. 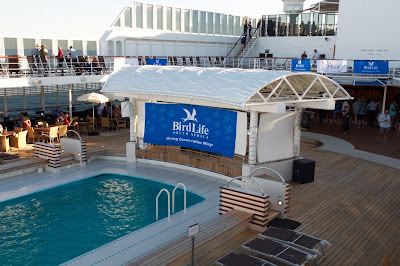 The event’s themed penguin dinner would have been more fitting as the closing social, up on the open deck, on Thursday evening, at a single sitting for the entire ship’s company. Restaurants, including the buffet should have been closed for the duration of Thursday’s social. The Captain’s Dinner is a tradition & should be respected; and not thematically overlapped – i.e. the excursion’s opening social. Out on the viewing decks, whilst most of the Guides were adequately attentive, communication across the decks was understated and birds called once were not consistently called again. Guests move stations… often. The guiding standards were okay – as expected – some identification howlers & particularly from the bushveld-based – guides will forever go down in infamy. We’re a fallible, sensitive species… Be gracious. Two Guides stood out for me – both seasoned seabird professionals with an eye for detail. One was asked to vacate his seat from atop a bollard on Deck 8 by an unsmiling, ill-mannered security officer and the other latched onto Alisha’s ‘Subantarctic Shearwater’ with professional ease. The Zest Guides were almost always stationed elsewhere unfortunately – their followers legion, no doubt; their ability indisputable. That said, I’m sure Barry was missed; an icon in local sea-birding circles and one of few to have seen Light-mantled Albatross before the rest of us had that honour. 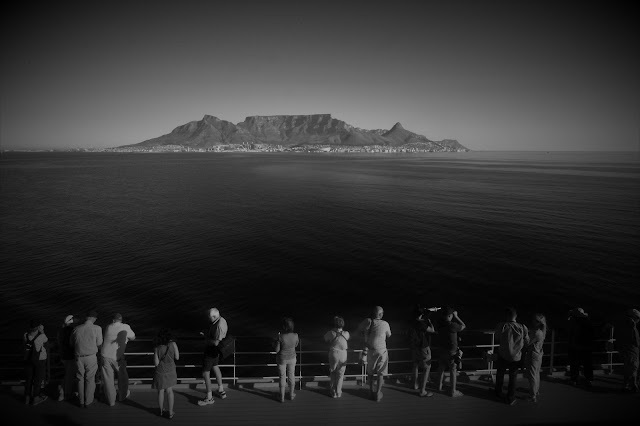 It’s on an excursion like this one that we’re reminded of the fleeting nature of life & of other special times – Barry featured prominently on many other pelagic-excursions which we were fortunate enough to be passengers on; one of which is still remembered by most on board, all these years later. Recognised for his outstanding contributions to ornithology and awarded the Gill Memorial Medal Award, Birdlife SA’s highest accolade, I was saddened to see the poor turnout at Professor Underhill’s lecture later that evening; the excursion’s last. A slot immediately before or after the AGM would have been more appropriate. If the seabirds were the chief protagonists in an unscripted show; the entertainment was found behind the rail; on two legs. Another exuberant dumpling, a rainbow of radiance & accustomed to the finer things in life, demanded a hand-hoist up to a platform from which she’d have uninterrupted views of the surf & serf down below. 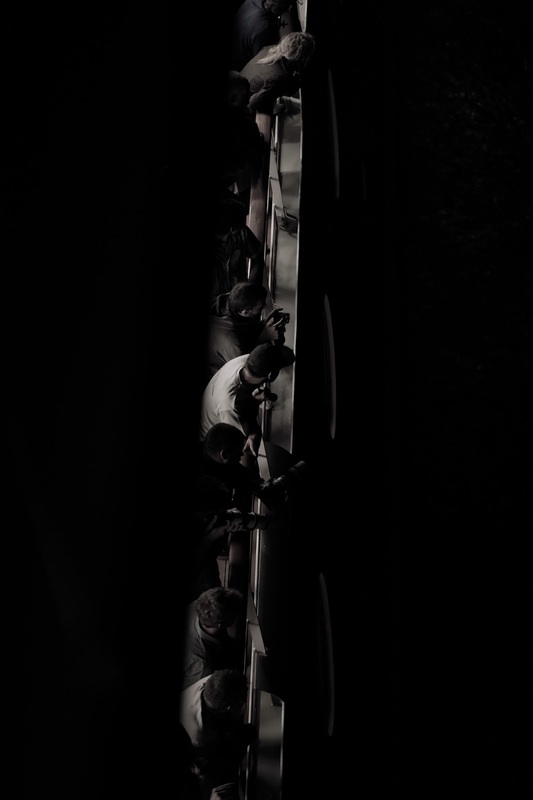 Hands, many coarse, hairy, unfamiliar hands, pushed her from below, white-knuckles long hidden in the bottom’s sag – others groaned above – hauling, bug-eyed, against the earth’s gravitational pull. The core of her remained unmoved, in suspended animation, four feet off the deck. When her knees had passed her quivering chins she called time or she or they would likely have split a seal & sprung a leak. As for myself, a round of $-denominated drinks [Made in South Africa], keeled over in a funk & landed in my lap; an ice-like vice in Monday evening’s gale when the chill factor was close to inversion. But more than that & in addition to the birds of that incredible Tuesday morning, we will remember this cruise for the people; people who banded together, at some expense, to secure the exclusivity of the Sinfonia & the freedom of travel that support allowed; people who volunteered their equipment to those whose optics might not have been quite up to the task; for the patience of strangers assisting those who struggled to get onto birds and for the dedication of the many, both young & old, who held vigil at the rails, hour after hour, in the hopes of sharing something new; something special.